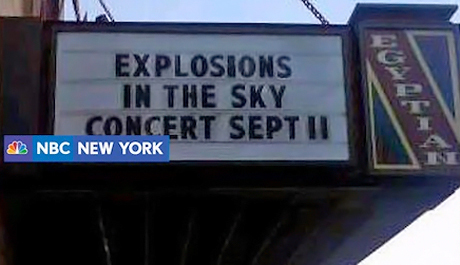 Over the years, Texas-based Explosions in the Sky have generally elicited cheers of praise from fans and critics over their soaring, symphonic post-rock jams, but Boise, ID locals are likely gasping at a poorly chosen theatre marquee advertising one of the group's upcoming gigs. NBC [via Pitchfork] points out that the band's Idaho concert couldn't be more poorly timed, as it lands on September 11, thus coinciding with the tenth anniversary of the 9/11 attacks in the U.S. Needless to say, many were disturbed by the Egyptian Theatre's marquee announcing Explosions in the Sky on September 11. The band have been forced to deal with terrorist allegations before. While their name has stirred up controversy, a cryptic liner note in the layout for the group's 2001 disc Those Who Tell the Truth Shall Die, Those Who Tell the Truth Shall Live Forever, which read "this plane will crash tomorrow," caused the band some grief. Guitarist Michael James was also detained an airport once because his guitar case featured a sticker with the same message. The band, who are currently on tour in support of their latest album, Take Care, Take Care, Take Care, have yet to comment on the incident.